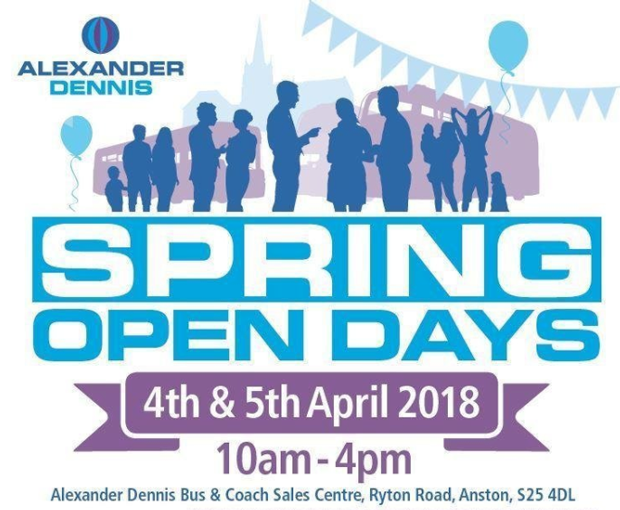 Alexander Dennis, the UK’s leading bus and coach manufacturer is hosting a Spring Open day today and tomorrow from 10am until 4pm. Taking place in Anston, visitors will see their range of new and and used buses and coaches, take a test drive and also cash in on open day special offers. Mistral are pleased to be supporting this event with our own team in attendance. Special offers will be available on their new and used coaches that are exclusive to the two-day event. Demonstrators of their built-to-order range of new Euro 6 buses and coaches will also be showcased. A Plaxton Panther, an Enviro 200 and their fantastic Enviro 400 will be available to test drive. Make sure you come along to the two day event to get the latest addition to your fleet, all at the best price. Located at the Alexander Dennis Bus & Coach Sales Centre, Ryton Road, Anston, S25 4DL.